As Japan struggled to come to terms with the new worlds of mechanisation and industrialisation, forging closer ties with the countries of the West in the late nineteenth and early twentieth centuries, Japanese artists became embroiled in the processes of tumultuous change. Long established and powerfully entrenched traditions were both challenged and revitalised. In painting two distinctive attitudes emerged. One, known as yôga, followed Western styles; the other, 'nihonga', extended the Japanese tradition. In the nationalistic Taishô (1912-26) and early Shôwa eras (1926-89) 'nihonga' was the dominant style. Kainoshô, from Kyoto, was a leading 'nihonga' artist. In this beguiling figure he synthesises the Japanese aesthetic with qualities of modernity, particularly evidenced in the colours and graphic fluency. The drawing of the face and modelling of the features also betrays some Western influence. In a biography of Kainoshô, Isamu Kurita notes that the artist employed one particular model who, according to his sister, was 'the only woman whom my brother, who preferred men to women, wanted to marry'. The woman was Maruoka Tokuko, quite possibly the subject of this painting. Previously the mistress of a stockbroker, she subsequently married a doctor, while seemingly remaining Kainoshô's constant muse. Art Gallery Handbook, 1999. pg. 286. 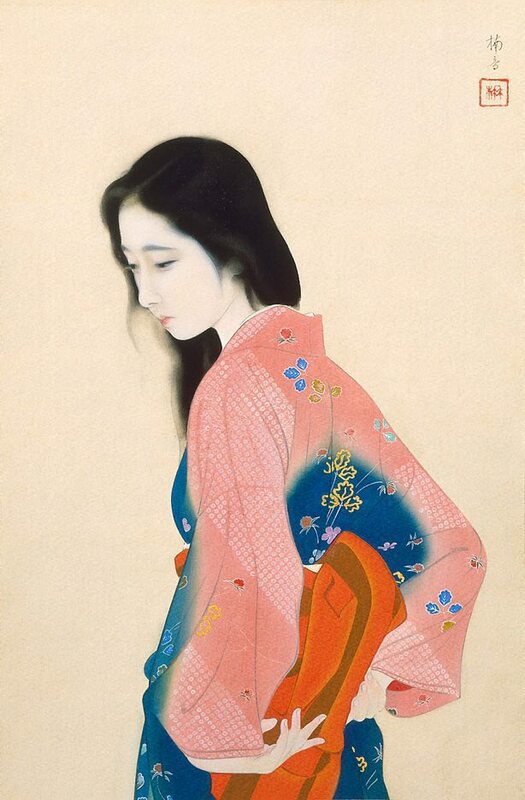 '(Mr Masayoshi Kainoshô (the artist's nephew) and his wife confirmed that the model was Tokuko at an interview with the curator of Japanese art in 1999)' AJIOKA Chiaki, Curator of Japanese art, AGNSW, May 2000. Signed u.r., in Japanese [inscribed in ink] "Tadaoto [and artist's seal]". Not dated. Bruce James, Art Gallery of New South Wales handbook , 'Asian Collection: East Asia', pg. 246-287, Sydney, 1999, 286 (colour illus.). Jackie Menzies, AGNSW Collections , 'Asian Art - India, South-East Asia, China, Tibet, Korea, Japan', pg. 173-228, Sydney, 1994, 226 (colour illus.). Distributed Titles. January - June 2004 , United Kingdom, cover (colour illus.). The colour illus. on the cover is a detail of this work. The Asian Collections Art Gallery of New South Wales , 'A New Dichotomy', Sydney, 2003, cover (colour illus. ), 278 (colour illus.). The colour illus. on the cover is a detail of this work.